Last week I didn't post daily. Even the book review post on Thursday was scheduled ... just so you had something to read :) I actually enjoyed the break. It's not often I take a break from blogging and usually it coincides with a holiday where my diary entries move to paper only to be re-captured on my return. Last week I didn't write for very different reasons. I was having a bit of an emotional week. They happen. Usually they're happening when my blog-posts are a maximum of 5 lines long. I don't like to write it all here ... although I often think I should, and just not publish it. But then, although I'll have vented and got it out of my system, I'll have something to dwell on and re-read. So I don't. A lot of it has to do with life. My life particularly. Sometimes I do blog about it, but as I said in my hiatus post, I'm prone to write and talk of the bad more than the good. Because when things are good, most of us are blissed-out and just enjoying them. But when they're bad they infect everything. I was having a week where I was really questioning Varen & I. I have days where I can see our whole future in front of us and want it more than anything. And I have days where I can't believe we stand any sort of long-term chance. It's days like that, where I'm assessing and re-assessing the choices that have brought me here, that leave me wondering if I have the strength to make a dramatic change ... and if that change wouldn't be of the "out of the frying pan into the fire" variety ... and if I could live with that. I wish I was one of those people who "just knew". I'm not. I've never just known anything in my life. So how do you trust the future then. Sure you can just stick it out and hope for the best ... but will that be the right path. On days like last week, I'm obsessed with taking the "right path" and making the "right choices". On my more normal days, I'm quite happy to let life come along at it's own pace and go with the flow. These conflicts surge within me and make me crazy. Well lots, really. It was a rough week for Varen & I, but we survived it (I think having a weekend away planned at exactly the right time helped a lot!). I re-discovered Luca's divine salad. Varen & I met his dad's new lady and enjoyed another dinner at The Attic (I think it's safe to say it's Varen's favourite restaurant these days). I made a delish meal on Thursday night (I forget the exact recipe name, but it was mexican-styled and I learnt a new trick to make the most delicious accompaniment with tortilla's !). Varen made his first disasterous meal on Tuesday night, we attempted Butternut Gnocchi which was a resounding failure with us only eating after 20h30 and neither of us finishing what we dished up :( Hey, all a good learning experience I say ... when you're trying new recipes each week, there's bound to be some things that don't work out quite right and that you don't enjoy. How else would you appreciate the things that are really yummy in life? 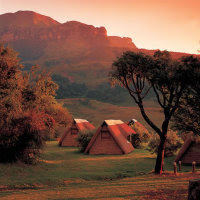 Our saving grace this week was that it ended with a weekend away in the Northern Drakensburg at Sungubala Mountain Camp. I got a great deal on 2 nights dinner, bed & breakfast on the St Lukes Auction. We arrived at about 7pm on Friday night, in the dark and proceeded to be ferried by 4x4 up to the camp from Reception. Up and up we went! We arrived just in time for dinner. Both our nights & days there were beautifully clear and we saw endless stars in the evening and had a truly amazing view across the valley from the camp. Stunning surroundings and a still quietness you forget exists in the city. We stayed in one of their A-Frame huts, which are quite tiny, but we were comfortable and warm at night. The only downside is that there is a separate ablution block with the toilets & showers ... which is a bit of a nightmare when you need the loo in the middle of the freezing night! But on the plus side, the entire camp cleared out on Saturday morning after breakfast and we practically had the whole place to ourselves! Above is a photo from their website, I stupidly left my camera at home - that's what happens when you pack the night before! I did take a few shots with my Blackberry, but haven't downloaded them yet. On Saturday morning, after breakfast Varen & I did one of the walks (they have loads, so if that's your thing I highly recommend it! ), a very short one, just to go and see the Silent Lady (right). After that we just did some serious relaxing and reading. And later headed off to the Tower of Pizza for lunch (I'd been there years before with Bean and we drove passed it on our way to Sungubala so I was keen to try it again - although we'd taken lunch, which we ended up eating on Sunday instead). Some very yummy pizzas (although my pizza had a little too much chili on it!). On Sunday we left shortly after breakfast and I wanted to stop at the Vulture Restaurant at the Sterkfontein Dam on the way home (I'd also done this years ago with Bean but wanted Varen to see it). Sadly it doesn't seem to be there anymore :( So we ended up getting home around midday (Sungubala is about 4hrs from Joburg) which was great cause I still got to spend time with the boons this weekend and we finished watching Lost S5. i don't believe in "just knowing" - everything in life is uncertain. the only thing to do is to make a decision, stick by it and hope like hell it turns out okay. and if it doesn't, just do your best to pick up the pieces. Hey, it sounds like you are going through an uncertain time. I also don't believe in knowing, and sometimes circumstances don't lead you either. Sometimes is is good to wait and see and sometimes it could be good to do what EXmi says and just make a decision. But it is tough. Do not ever try to "just know". I am from those people who "just know" but you must know how much it hurts not to know at certain times. So it is rather "not to know" always than to "just know" sometimes and other time not.